In cultural studies and media studies, the question of consumer agency continues to be contested with respect to the role played by context (cultural, political, social, economic, etc. ), identity (gender, race, ethnicity, class, etc. ), media (institutions and content), and material culture (technology, environment, food, fashion, etc.). In the context of food studies, eating has been studied from several angles: as a form of commensality (Julier 2013), a sign of distinction (Bourdieu 1984; Johnston & Baumann 2010; Naccarato & Lebesco 2012), a marker of identity (Gabaccia 1998; Pilcher 1998; Inness 2001), a good site to study global politics (Heldke 2003; Inglis and Gimlin 2010) and even a type of communication (Cramer, Greene and Walter 2011; Rousseau 2013; Elliott 2016). While eating has been, in these studies and several others, loosely considered a practice, it has rarely been theorized as such. 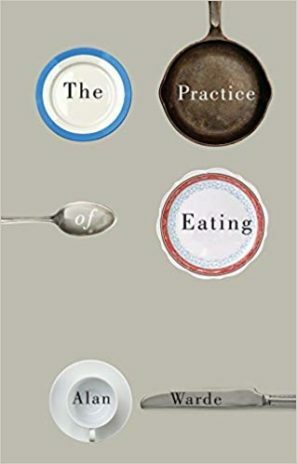 Alan Warde’s The Practice of Eating considers eating as a practice in relation to questions of agency, habit and food consumption, and produces a theory of eating as “an entity, as a constituted, compound Practice” (98). A major contribution of this approach to eating consists in the author’s observation that eating escapes the traditional modes of institutionalization and regulation due to the fact that much of eating takes place in private. This observation generated one of the major inquiry lines in the book: despite the lack of institutionalization, “most people adopt an orderly and practical mode of going about eating. The puzzle lies in fathoming how this is achieved” (99). To delve into this question, Alan Warde approaches the matter of consumer choice by bringing in the tools of practice theory, a sub-set of sociology which “gives precedence to practical activity as the means by which people secure their passages through the world” (32). The book takes as its goal “to make clearer what is at stake in defining eating as an activity and to propose a set of concepts to frame it as a moment of consumption” (3). The motivation for this study is made very clear in the volume’s introductory chapter, where Warde claims that cultural analysis (and its many weaknesses) have produced “the model of an active and reflexive actor, implying that conscious and intentional decisions steer consumption behavior” (4). Therefore, the application of practice theory to eating is the author’s attempt to “offer remedies for both substantive and explanatory deficiencies of cultural analysis” (4). Such a characterization of cultural analysis might sound surprising to scholars who use cultural theory and analysis to problematize exactly the relation between the consumer and her environment. It would have been useful for Warde to be more specific as to what he means by “cultural analysis” and to state with clarity the names of those cultural theorists with whom he converses in this study. Despite the generalizations made about cultural analysis, Warde offers a compelling argument on practice theory and the sociology of consumption – areas to which he is a major contributor, building the reader’s trust thorough his meticulous theorizing of eating as practice. Starting from the premise that “the concept of practice captures eating particularly well” (7), the author explains, in Chapter 2 (“Towards a Sociological Theory of Eating”), that current sociological studies of food are overwhelmingly concerned with food production and moments of crisis (ex: anxieties related to modern industrial food production) and “give little weight to theory building or theoretical synthesis” (20). Consequently, the process of consumption, of which eating is a prime example, has been marginalized, leaving room for the development of a theoretical framework informed by practice theory. Warde provides an inventory of scholarship that touches on aspects of eating – for example, the writings of Stephen Mennell, John Goody and Pierre Bourdieu – but he is generally unsatisfied with such contributions with respect to a theory of eating. Much of this dissatisfaction is again targeting cultural analysis, which, according to Warde, “tended to ignore practical and routine activity in favor of the more expressive and conspicuous aspects of life” (28). The following chapter (“Elements of a Theory of Practice”), introduces recent developments in the theory of practice, arguing that this body of intellectual contributions has the potential to “bring the social back in” (31). With great skill and a critical eye, Warde synthesizes the works of several important scholars in the study of practice, such as earlier contributors Sherry Ortner, Anthony Giddens and Pierre Bourdieu; promoters of the second phrase of modern practice theory, Theodore Schatzki and Andreas Reckwitz; and scholars in fields other than sociology who have made use of practice theory (e.g. Nick Couldry). For Warde, the most helpful collective contributions of these works point towards the fact that “practices are the fundamental units of social existence and hence the core concept of social analysis” (50). This chapter makes a distinction between practice as a “routinized type of behavior which consists of several elements” and Practice as “an emphatic term to describe the whole of human action” (Reiczwitz qtd. in Warde 44). In this framework, a practice such as eating requires coordination, achieved through the commitment of individuals, groupings of people, and organizations to deliver “proper conduct” (45). This conduct is manifested at the level of the many practices which define the standards of performance and act together and with the aid of other mechanisms, such as “artefacts, texts, organizations and public events” (47). Once the foundations of practice theory have been assessed, Warde asks, in Chapter 4 (“Elementary Forms of Eating”): “how should eating be defined and delimited so that it becomes amenable to scrutiny?” (52). This question opens up discussion on eating as a process of consumption with particular attention paid to the performances which make up this practice in relation to three elementary forms: “foods consumed, bodily processes and social arrangements” (58). Following the leads of scholars from anthropology (Mary Douglas) and sociology (George Simmel, Norbert Elias) who have focused their work on the meal as a mode of exploring eating, Warde observes the performances afforded by “the three principal analytic dimensions of performance of eating” (76): 1) events and occasions; 2) food, menus and dishes; and 3) incorporation. These distinct components of the meal suggest that “eating is situated within established patterns of social relations and shared understandings which steer the orchestration of timings, settings and compassions in a conventionally recognizable and acceptable manner” (77). Warde’s line or argumentation suggests that the individual has little room to exercise free thinking when acting within such pre-ordained structures of performance, in which “orchestration seems to occur as a matter of practical sense, of knowing how to go on, without thinking” (79). At this point in the volume, readers might start to empathize with the uncritical consumer sketched by Warde’s argumentation, and crave some much needed empirical evidence or references to a specific historical and cultural context. Unfortunately, with the exception of very brief references to a project on cultural consumption in the United Kingdom in which the author participated, the reader will be left wanting. The strengths of the volume are consistently visible in the next set of chapters (Chapter 5, “Organizing Eating”; Chapter 6, “Habituation”; Chapter 7, “Repetition and the Foundations of Competence”), which are intended to solve “the theoretical puzzle” of how the orchestration of eating “is normally achieved” (79). In agreement with Claude Fischler and Jean-Pierre Poulain, Warde writes that “no wholeheartedly agreed upon authoritative template for the practice of eating is adopted by whole populations” (81). At the same time, continues Warde, even in the case of eating, “practices have standards beneath which performances should not fall if they are to be considered acceptable by observers” (83). Therefore, “shared understanding” is essential for the reproduction and recognition of eating as Practice, requiring investigation of “modes of symbolic communication and social coordination” (83). Texts, such as restaurant guides, cookbooks and etiquette manuals are important factors in the regulation of eating. Of equal importance is the institutionalization of regulatory frameworks, such as government campaigns and school curriculum, which can act upon practices. However, Warde argues, eating does not display a “dominant authoritative regulatory framework” (99) in the same manner as motoring, for example. Another set of concepts will be crucial in determining how a seemingly fluid and unorganized Practice, such as eating, can convince individuals to adopt an orderly mannerism nonetheless. The answer for Warde does not reside in his trust of individual rationality, self-awareness and independence, which one might expect. Contrarily, the author believes that “the importance of deliberative thoughts in everyday life is exaggerated” and “the degree of personal control and initiative available to the individual is overestimated” (101). It is here that the volume makes its core intervention to the literature: the repetition of habits and exposure to “symbols, clues and affordances” present in the external environment explain the existence of a structure to the otherwise unruly practice of eating (111). The remainder of the book develops a theoretical tool-kit composed of thorough reflections on various concepts – routine, custom, convention, disposition – which can be used to further explore processes of habitualization and “competent automatic conduct apparent in everyday performances” (120). In his theory, Warde accounts for change in practices, but only in very specific circumstances: improvement or progress and change in the environment. The author continues this discussion in the final chapter of the volume (“Conclusions: Practice Theory and Eating Out”), nuancing his explanation of performance of practice to account for the work of cultural intermediaries, primarily media texts, to create controversy, which produces change. As a cultural theory scholar, I am conflicted by this volume as I found it incredibly useful in its formulation of a vocabulary for observing eating as practice, providing a carefully orchestrated set of concepts which are rarely differentiated and defined in academic discourse. The volume is innovative in attempting to theorize eating, a very complex and messy Practice, and for its sophisticated critique of the neo-liberal self. But perhaps attempting to tame such a disorderly Practice comes with a price; in this case, the multitude of overgeneralizations about how people eat with very little empirical evidence and proper historical contextualization (ex: the shift in taste in Great Britain for foreign foods has a “general environmental explanation,” assuming a homogenized integration of “other” dishes and ingredients), the misrepresentation of entire bodies of knowledge with a long and multidisciplinary history (ex: cultural analysis as inattentive to social context), and the appropriation of theoretical frameworks without acknowledgement of their existence (ex: description of a process which resembles hegemony without naming it as such). The digestion of this volume depends, in the end, on the disciplinary identity of the reader. Irina D. Mihalache is Assistant Professor at the Faculty of Information, University of Toronto and teaches in the field of museum studies, focusing on museum interpretation, food and material culture, curatorial practice and global museums. Her research explores the intersections between food and museums. On this topic, she has co-edited a book, Food and Museum (2016, Bloomsbury Academic) which features writings (and recipes) by chefs, artists, academics and museum professionals. She has written several book chapters on museum restaurants and audience engagement; on restaurants in French post-colonial museums; and on culinary programming organized by the volunteer committees at the Art Gallery of Ontario between 1940-1970.